After Deadly Chemical Plant Disasters, There's Little Action Proposals for chemical plants to use "inherently safer" design practices have been blocked by industry executives and their allies in Congress, despite deadly accidents and the risk of a potential terrorist attack that could harm an entire community or city. 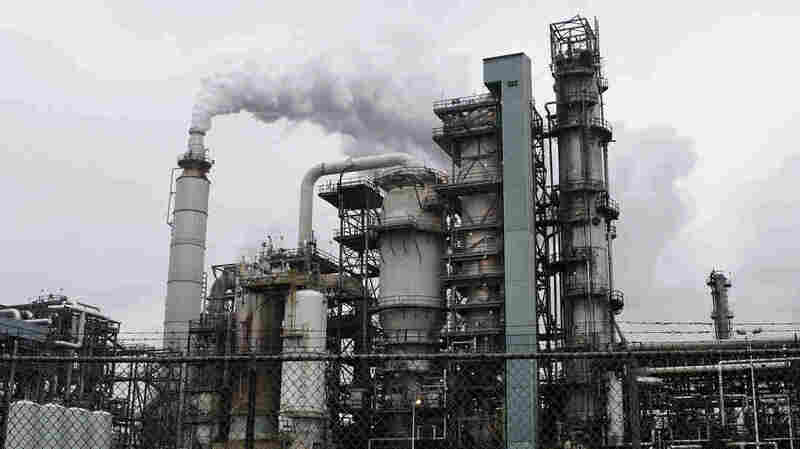 The PBF Energy refinery in Paulsboro, N.J., uses toxic chemicals such as hydrofluoric acid. Rather than using "inherently safer" design methods, the industry says, other safety measures are taken to prevent accidents like the one in West, Texas. You might think that everything would have changed for the chemicals industry on April 16, 1947. That was the day of the Texas City Disaster, the worst industrial accident in U.S. history. A ship loaded with ammonium nitrate — the same chemical that appears to have caused the disaster last month in West, Texas — exploded. The ship sparked a chain reaction of blasts at chemical facilities onshore, creating what a newsreel at the time called "a holocaust that baffles description." Or you might think everything would have changed on Dec. 3, 1984. 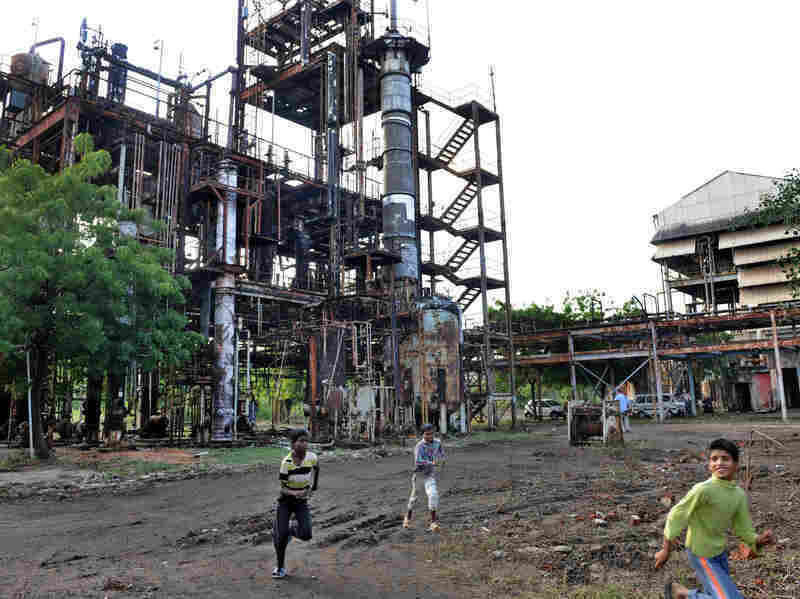 That was the day that the U.S.-owned Union Carbide pesticide plant on the edge of Bhopal, India, suddenly began to leak — spewing a cloud of deadly gas over the city. By all accounts, thousands of people died; the Indian government never made an accurate count. Union Carbide paid $470 million damages. Or you might think the chemical industry would have been forced to reform after March 23, 2005, when an explosion at a BP refinery in Texas City killed 15 workers and injured 180 others, according to a federal report. A BP spokesman says the company paid $1.6 billion to compensate victims and their families. Or change could have taken place after any of the hundreds of fatal accidents at chemical facilities in the past dozen years, according to the U.S. Chemical Safety Board, an independent federal agency, based on media reports. In this photograph from 2009, children play in front of the Union Carbide factory in Bhopal, India. Twenty-five years prior, in 1984, it was the site of a deadly gas leak that killed thousands of people. For years, a loose network of environmental groups, public health organizations and members of Congress, both Democratic and Republican, has fought to require companies to try to redesign their chemical facilities, to make them safer. Engineers often call the approach "inherently safer" technology or design. But industry executives and their allies in Congress have blocked the proposals. Christine Todd Whitman, a former administrator of the Environmental Protection Agency, says she was angry when she heard about the West fertilizer plant explosion in April. "It just made me so mad, you wanted to take Congress and shake it, and say, 'Listen, what more does it take for you to understand that we need some action here?' "
Whitman led the EPA for President George W. Bush from 2001 to 2003. "I'm a Republican; I'm leery of too much regulation," she says, "but there are times when you need it. There's a reason for some of this stuff." Over the past few decades, government and industry have taken some steps to make chemical plants in the U.S. safer. For instance, Congress passed two landmark laws in the years after the Bhopal disaster. Together, they require plant owners to disclose exactly which dangerous chemicals they use at specific plants; estimate how many people would be at risk of getting killed or injured if there were an accident at the plant; and spell out what steps they are taking to prevent it. But after terrorists destroyed the World Trade Center on Sept. 11, 2001, security specialists began to worry that those laws weren't strong enough. "Chemical plants are really pre-positioned weapons of mass destruction," says Charles Sam Faddis, a former CIA officer who ran the CIA team that searched for WMDs in Iraq after the U.S. invaded. They didn't find weapons of mass destruction there, but Faddis says he realized that if terrorists had attacked a U.S. chemical plant instead of the twin office towers, they might have caused a bigger disaster. The chemical industry's own reports back then, filed under federal law, show there were hundreds of plants across the country where a single incident could potentially kill thousands of people. For instance, D.C. Water — Washington's water and sewer utility — reported that if tanks of chlorine gas ruptured at its Blue Plains wastewater treatment plant, a deadly cloud could reach the U.S. Capitol. So, some Bush administration officials decided that there was a fundamental problem with the way the government regulates chemical plants. The laws tell chemical plant owners, in effect, that it's fine to use large amounts of deadly chemicals, even if the plant is next to a city — as long as the company protects them with measures such as strong tanks and fences. And in case there is an accident or a terrorist attack, the company needs to have an emergency action plan to protect the community. Officials at the time, like Bob Bostock, EPA's homeland security adviser, said those aren't solutions but Band-Aids. "It was the only thing that kept me up at night," Bostock says — the fear that terrorists would blow up a tank of chlorine or other toxic chemical and trigger a disaster in a major city. Executives at some companies used the inherently safer design approach after Sept. 11 and reduced their use of dangerous chemicals. D.C. Water, for example, got rid of deadly chlorine gas only a few months after the attacks and started treating wastewater with safer methods. Bostock and Whitman drafted a law in 2002 that would have required chemical facilities across the country to see if they, too, could use inherently safer design. Bostock says they knew that every plant might not be able to eliminate or cut back on its use of the deadliest chemicals. At some facilities, it might be technically impossible or too expensive. But the draft legislation would have required executives to at least examine whether it could be done. "If there was ever a successful attack on one of these facilities or even an accidental release," Bostock says, "the first question you would get asked as a policymaker is, 'You knew this was a problem. Why haven't you done anything about it?' "
Meanwhile, up on Capitol Hill, a separate bill calling for inherently safer technology sailed unanimously through a key Senate committee. Then everything screeched to a halt. Whitman and Bostock say top aides to President Bush told them the push for inherently safer design "was not going anywhere," as Bostock remembers. "It was dead." White House officials never publicly explained why. Since then, a coalition of more than 100 public health, environmental and labor groups and security specialists has tried repeatedly to get Congress to reconsider. It tried in 2003, 2006, 2009 and again in 2010. But in each case, opponents managed to block the proposals. Whitman attributes the defeats, in part, to pressure from the chemical industry. "There are very powerful influences, and in politics you always sort of trace that back to the money," Whitman says. Campaign finance reports, collated by the Center for Responsive Politics on OpenSecrets.org, show that the petrochemicals industry has been one of the main funders for key members of Congress who have opposed inherently safer design. And lobbying reports, collated by the Sunlight Foundation, suggest that chemical industry trade groups have made the fight against bills requiring inherently safer technology one of their priorities. 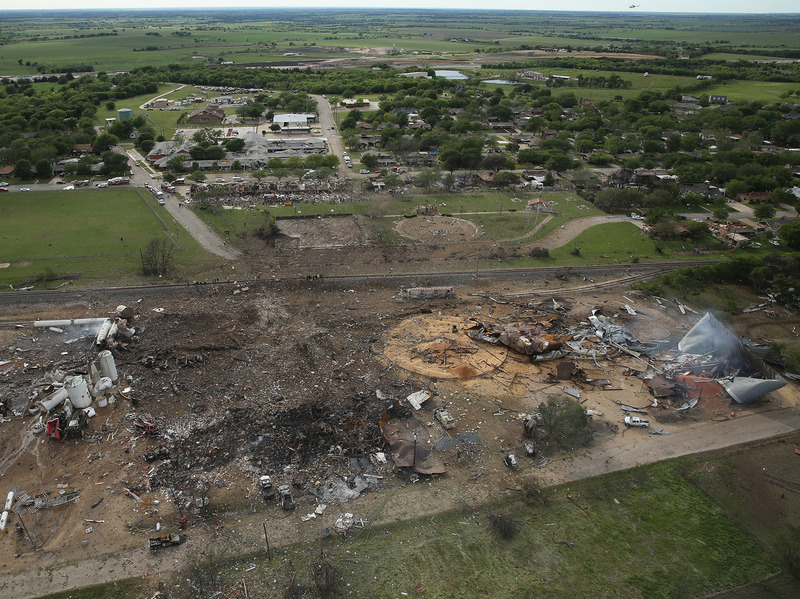 The West Fertilizer Co., shown from the air, lies in ruins after an explosion that killed 15 people, injured more than 150 and damaged houses and buildings for blocks in every direction. Industry spokesmen say petrochemicals are already one of the safest and most regulated industries. "We stand second to none as the chemical industry in trying to implement an appropriate focus on process safety and security," says Michael Walls, vice president of the American Chemistry Council, which represents most of the leading corporations from Dow and DuPont to Exxon Mobil and Chevron. The council has lobbied Congress for years to kill bills concerned with inherently safer technology. In fact, together with other industry groups, they have told Congress that companies should not even be required to consider whether it should be implemented. On the face of it, the call for companies to switch to safer chemicals "does sound attractive," says Walls. "But the basic choice comes down to, do you mandate something like a review of inherently safer technology, or do you want to require its consideration at the right time for each particular facility? One of the questions here is, who decides? Who decides what is inherently safer in any particular case?" Walls and other industry spokesmen, such as Kathy Mathers, vice president of The Fertilizer Institute, worry that federal regulators might tell chemical companies how to run their business. "Agriculture knows agriculture," says Mathers. The institute represents companies that make and sell ammonium nitrate, among other chemicals, which may have caused the explosion last month in Texas and has caused some of the worst industrial accidents in history. "And certainly the regulators have their role in society. At this point we have not seen a version of an inherently safer technology bill that we would support." That perspective puzzles Rafael Moure-Eraso, chairman of the main federal agency that investigates accidents at chemical facilities. "I was quite surprised that anyone would resist this concept, this concept of prevention," he says, sitting in his corner office at the U.S. Chemical Safety Board, not far from the White House. The CSB, whose members are appointed by the President, is currently investigating what caused last month's fatal explosion at the West Fertilizer facility in Texas. Some of the CSB's official reports on chemical plant explosions recommend that the industry use inherently safer technology as one of the main strategies for preventing accidents in the first place — and limiting the damage when they do occur. In fact, Moure-Eraso says he supports the idea of a law requiring plant owners to see if their plants can eliminate or reduce the need for dangerous chemicals. "You have to make a cost-benefit about what is more costly: to engage in a process to try to mitigate or avoid hazards; or deal with the families of the people who get killed, the destruction of an industry, the destruction of a community," Moure-Eraso says. "And I claim that it's a lot more expensive to deal with these catastrophic losses than what it will take to invest to prevent this to happen in the first place." Advocates of inherently safer design wonder now where President Obama stands on this issue. Back when he was in the Senate, Obama co-sponsored a bill that would have required plants to consider inherently safer technology. And his administration supported the concept after he became president. But Rick Hind, legislative director of Greenpeace, says members of the coalition that has been campaigning for the approach are frustrated that Obama hasn't spoken out about it recently. "We're very concerned," says Hind, "because we've been asking [the Obama administration] to look into this and to do something since 2011. And they said, 'Well, after the election maybe we'll do something.' And now, we're still waiting." "Chemical plant safety is a high priority, and federal departments and agencies will continue to work within their authorities and with state officials to support the ongoing investigation and assess appropriate information that can help inform ongoing efforts to ensure chemical plant safety."